Enrique Cerna moderates a panel on prescription drug abuse in the KCTS-9 studio. Photo credit: Peter Johnson. 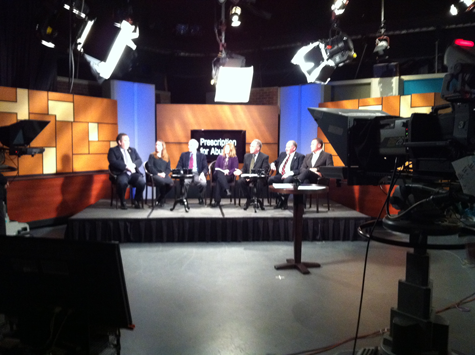 Experts on prescription drug abuse gathered at KCTS 9’s studios in Seattle today to tape a panel discussion. Over the course of a half hour, the panel discussed the medical and social causes of prescription drug abuse and policies that might make a dent in the addiction epidemic. The discussion will air Monday, January 30 at 9 p.m. on KCTS-9, following the airing of InvestigateWest and KCTS’s jointly-produced “Prescription for Abuse” documentary. The panel included policymakers, law enforcement, medical professionals, and treatment experts, as well as our own Carol Smith, who wrote the two-part investigation on which the documentary is based. The experts agreed that the massive upsurge of prescription drug abuse in recent years is directly related to an upsurge in opioid prescriptions from doctors; in the late 90s, the medical profession concluded that its methodologies for treating both chronic and acute pain were ineffectual and began to prescribe more opioid medications as a result. However, that well-intentioned change in medical practice resulted in disaster for many patients. Some doctors reacted to the new methodology by overprescribing medication for pain patients—a fumble that allowed incredibly powerful narcotics to sneak into American homes. Given that prescription drugs are prescribed by doctors for patients with legitimate pain needs, the profile of a prescription drug addict often doesn’t match that of a street drug user. However, instead of increasing his productivity, Riley found himself on a path deep into addiction — one that eventually led to his arrest for prescription fraud. Though it cost him the job he loved, Riley has embarked on a new career – one he finds even more meaningful — as an activist fighting addiction in the law enforcement and emergency worker community. To learn more, check out the trailer for the documentary.